Current Topics in Experimental Endocrinology, Volume 5: Fetal Endocrinology and Metabolism covers various aspects of fetal endocrinology. 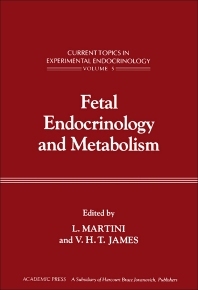 The book discusses studies of the hypothalamic-pituitary unit which emphasize the unique aspects of the fetal endocrine system; in vitro fertilization; and factors controlling placental endocrine function in domestic animals. The text also describes the role and kinetics of thyroid in fetal development; the placental transfer of carbohydrates; and fetal hormones and carbohydrate utilization. The regulation of partition of protein during pregnancy; the mineral needs of the fetus; and the fetal metabolism of cortisol are also considered. The book further tackles normal and abnormal sexual differentiation and the metabolic errors of adrenal steroidogenesis. Physiologists, endocrinologists, obstetricians, gynecologists, and students taking related courses will find the book invaluable.